Existing and potential sources of nuclear contamination in the Russian Arctic region, especially on the Kola peninsula and on Novaya Zemlya, are of international concern. There are numerous locations on the Kola peninsula where nuclear fuels and reactor components are stored. They include Murmansk and Severomorsk, home ports for nuclear submarines and ice-breakers of the Russian Northern Fleet, at Litsa, a submarine base about 45 km from the Norwegian border, and at Kildin, an island in the Barents Sea. The Bellona Foundation in Norway has published extensively on radioactive waste problems in this region (e.g., Nilsen and Bohmer, 1994). 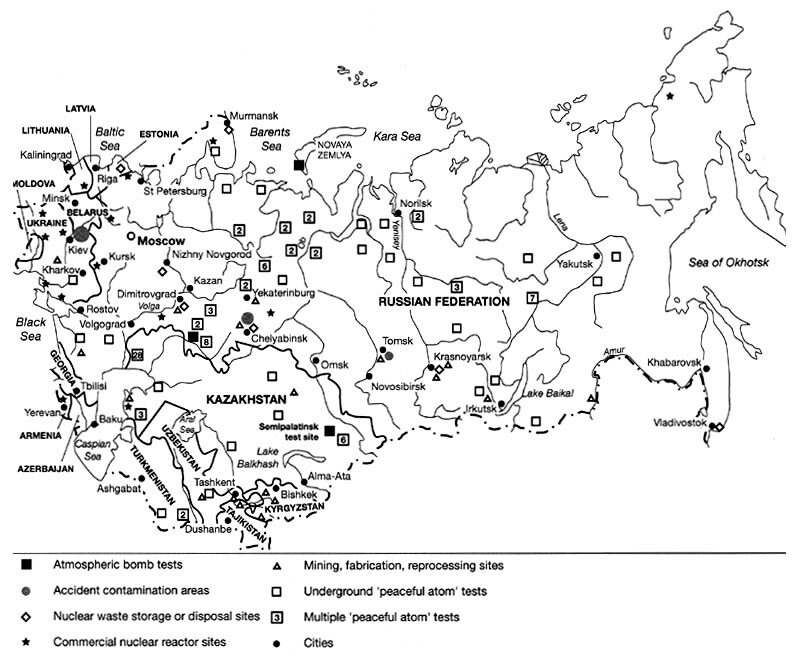 The extent and location of radioactive waste sites on and around Novaya Zemlya became public knowledge in 1992, and was widely reported (e.g., Bradley, 1992b; New York Times, 24 November 1992). There are about eleven offshore waste repository sites, some near the coast but one around 100 km out into the Kara Sea. These sites contain various types of spent reactors, at least four scuttled ships with nuclear reactors, and thousands of individual waste containers. Two sites on Novaya Zemlya have been used for nuclear weapons tests. In all, 132 tests were conducted between 1955 and 1990: 86 in the atmosphere, 43 underground, and 3 under water. Twenty-eight of the underground blasts vented radiation to the atmosphere (Matzko, 1994). The first nuclear detonation on Novaya Zemlya in 1955 was set off beneath Chernaya Bay, and very high levels of caesium and plutonium are still present in the bottom sediments. These are confined in the sediments for the time being, but are of long-term concern in the context of the Arctic Ocean food chain. The largest nuclear device ever exploded (58 megatonnes) was detonated over Novaya Zemlya in 1961 and produced fallout recorded all around the Northern Hemisphere. Ninety-four per cent of the combined explosive force of all the USSR's nuclear tests were detonated at Novaya Zemlya (Nilsen and Behmer, 1994). Other than at three specific test locations, radiation levels on the surface of Novaya Zemlya are today described as 'only marginally above background level' (Bradley, 1997). Russian Federation officials have acknowledged that the USSR deposited highly radioactive wastes into many locations in the Barents and Kara Seas from 1964 to 1986 (Yablokov, 1993). Various sources have suggested that at least 10 000 or 11 000 containers of radioactive wastes have been dumped in violation of the London Convention, which prohibits ocean dumping of nuclear wastes (Izvestia, 29 October 1991; Nuclear Waste News, 28 November 1991). These wastes include the damaged core from the nuclear ice-breaker Lenin, sunk off Novaya Zemlya in the 1960s. This has led to concern for the overall condition of the Kara Sea. Including the dumping mentioned in the preceding paragraph, radioactivity has reached (and in some cases is still reaching) the Kara Sea from five different sources or avenues: (1) direct dumping of wastes or waste containers; (2) fallout from atmospheric testing (at Novaya Zemlya or elsewhere); (3) releases from West European fuel reprocessing plants; (4) fallout from Chernobyl; (5) radioactive material carried by the Ob and Yenisey river systems. Estimates of the total amounts of strontium-90 carried to the Kara and Barents Seas range from 64 000 to 180 000 Ci; a somewhat greater amount of caesium-137 has been estimated. The largest single source of caesium-137 to the Barents Sea is reprocessing wastes dumped by Great Britain at Sellafleld and by France at La Hague (Bradley, 1997). The great majority of the wastes in the Kara Sea is either in containers or in bottom sediments, and hence poses no immediate danger to humans. The concern is over possible future disturbances to these repositories, and to unknown ecological effects to the oceanic food chains. Within the same watershed, wastes from the Beloyarsk nuclear power plants have been discharged into the nearby Olkhovka marshes, giving concern that they may eventually pollute the Tobol river system (Nuclear Waste News, 10 October 1991 and Atomnaya Energiya, September 1991, as reported in Bradley, 1992a). There are several nuclear facilities situated along the shores of the Russian Far East. As on the Kola peninsula, submarine and other nuclear wastes are stored here, often improperly, and at least one serious accident has taken place. An explosion in a submarine's nuclear reactor occurred on 10 August 1985, at the Chazhma Ship Repair Facility in southern Maritime Province. Radioactivity was spread over a distance of several kilometres. There have also been reports of a leak in 1990 at a nuclear waste storage site on the Kamchatka peninsula, when a crack was discovered in the frame of a storage container for untreated high level wastes (Bradley, 1997).